while still being fairly loud. The green is just a little bit lighter. The dark green is covered with gold, toffee and cream foliage, birds and hats. 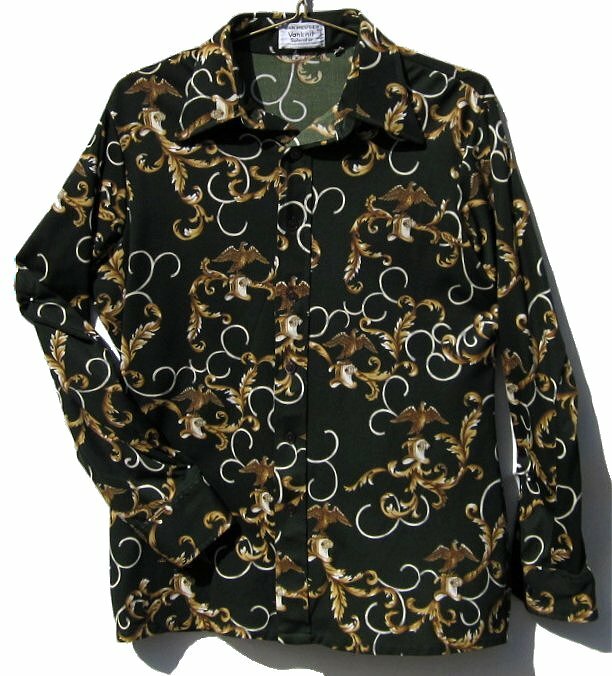 The shirt would match, cream, brown, gold or tan pants. The shirt was sized a L and it would now fit a Slender Large. The chest is 43" around for a 40" chest fit. The sleeve length is around 33", maybe a hair longer. The distance between the shoulder seams in back is 19". The original neck size is 16 - 16 1/2. The shirt is clean. I don't see any imperfections. It has very mild wear.